I serve on the Board of Reference for Sat-7, which is broadcasts Christian radio and television across the Middle East and North Africa. We, like many others, are very concerned about the situation in Egypt. We have many staff there and of course we are anxious to ensure that they all remain safe during this time of turmoil. On a personal level, I was also distressed to hear this morning that my son, who is a teacher in Cairo, was among the 2,000 injured in yesterday’s demonstrations – hit in the face by a rubber bullet as he passed out water bottles to both demonstrators and the security forces alike. Mobile phone lines have been periodically disconnected in the country so it is generally difficult to contact people living there – because most rely exclusively on their mobile phones. The Internet has also been down. But landlines seem to be functioning and we have heard that most of our team is staying out of harm’s way. The anger being vented on the streets against the Egyptian authorities is based on years of pent-up frustration. The country has experienced decades of stagnation—economic, educational and political. The lack of freedoms and opportunity has left an entire generation feeling hopeless. Our prayer is that the current unrest will eventually result in positive change leading to greater justice, security and political openness in the country—for all Egyptians including the Christian minority which, historically, has often been neglected and marginalized. But this is not a religious revolt, it is a political one, and SAT-7 is not a political entity. So we encourage Christians everywhere to pray that President Mubarak and his advisors will have wisdom in how best to respond to the justifiable frustrations of the Egyptian people, and that the violence will not lead to an even greater loss of life. SAT-7 ARABIC had a regularly scheduled live, call-in show “The Revealers of Secrets” slated for broadcast this evening, Saturday 29th January. This program and other upcoming live shows from Egypt have been cancelled due to the unavailability of communication services. The SAT-7 live programs typically offer an opportunity for church leaders to give Godly wisdom especially during difficult times. The live shows also provide a voice to the local Christian population. Please pray that these services become available once again so that we can continue this aspect of our ministry to the Egypt Church. I and the SAT-7 leadership will continue to monitor the situation in Egypt carefully. SAT-7 is also joining with the 10 million or more Christians of Egypt in calling on believers around the world to pray for a peaceful, just, and positive outcome to result from the political storm raging across the country at this time. Most of you use Facebook, Linked-In, or one of the other social media web sites. 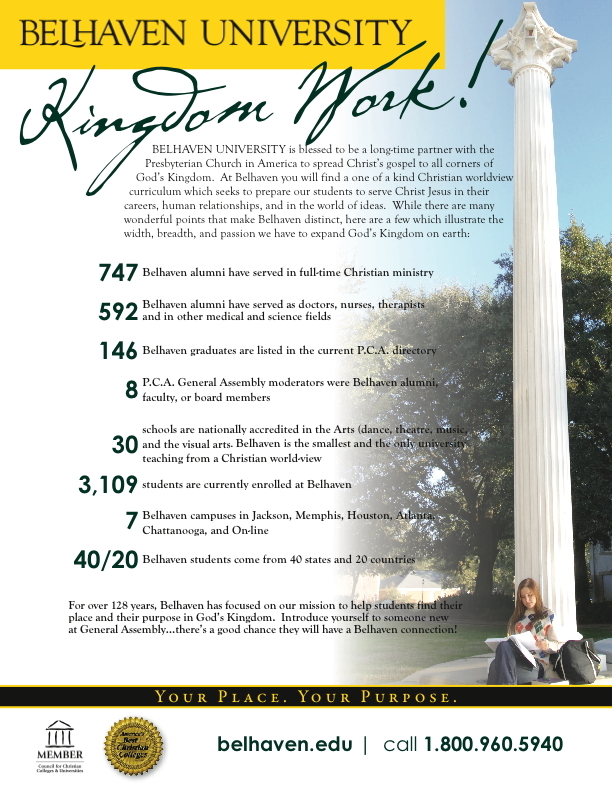 Would you do something small, that would help Belhaven in a big way? Would you put a link on your profile to Belhaven: www.Belhaven.edu This will help us more than you’ll ever know. Would you update the connection on the site to say Belhaven University rather than Belhaven College. And if you don’t currently mention BU, please do! Believe it or not, making these two changes helps rank us higher with the search engines. Our web team does a remarkable job getting BU found on the web. We come up in the top of most searches related to Christian higher education. And these two changes from you can help us even more. Whether you’re a student, employee, alum, friend, or fan, if you’d do these two things, it would be a nice gift to the University. Take the last 2 numbers of the year you were born. Add it to the age that you will turn this year. It will equal 111. Today the Southern States Athletic Conference announced the leaders for the Sportsmanship Award following the completion of fall sports. Among the 16 teams in our conference, Belhaven is first in men’s sports and third in women’s. Norcross, GA – In the competition for the Women’s Team Sportsmanship Award, Emmanuel College finished the fall season with a 3.0 average with a first place finish in their only fall sport of women’s soccer. Lee University finished the fall with a 1.67 total average and two first-place finishes in cross country and volleyball. Belhaven University, Columbia College, and Faulkner University finished the fall tied for third at 1.50. Belhaven also scored well in the Men’s Team Sportsmanship Award voting and is leading at 1.75 followed by Brewton-Parker College and Southern Wesleyan University both tied at 1.50. All three teams earned a first place finish in one of the fall championships. The kick-off session of our new Belhaven University Health and Wellness Series is set for Thursday, January 20th from 5:30 – 7:00 p.m. in Barber Auditorium. The health series is designed to help you and your family start 2011 on the right foot. This program, and others to follow, are made possible through a generous grant from the Blue Cross & Blue Shield of Mississippi Foundation. The seminar is for students, employees, and the public – come with your family and learn how to create a healthier lifestyle. This first session will be a unique, educational, and hands-on programs that have been developed to help participants improve their health IQ. Designed to inform you about the fundamentals of a healthy lifestyle, the educational programs are led by experts in a variety of fields and will be enhanced through interaction with Belhaven University Sports Medicine and Exercise Science students and faculty. For questions or more info, call the Belhaven University Advancement Office at 601-968-8746 or go to www.belhaven.edu/health. While the public sees student success and faculty/staff leaders who make possible the academic, athletics, and arts quality that make up Belhaven University, behind them are a team who keep this campus running. Our maintenance technicians and housekeeping staff are not only talented and dedicated, but they know God has called them to Belhaven to serve our students and employees. 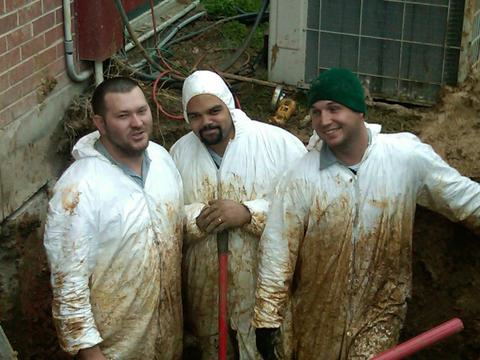 Yesterday and today, in the cold and wet, they are dealing with a broken pipe under one of our Men’s Resident halls. It wasn’t easy to fix, and even tougher to get to it. Here, in the “real trenches” of Christian Higher education, are Ricky White, Kevin Taylor, Trent Green. And knowing those guys as I do, they were probably joking and optimistic during entire time it took to get the job done. I’m thankful for the wonderful group of people who keep our campus clean and operating smoothly. We don’t thank them often enough. For about a dozen years we’ve had a tradition of closing our day-time classes on MLK’s Birthday, to come together as a campus to serve our community. Hundreds of students, coaches, faculty and staff headed out this morning with rakes, paint brushes, and other tools to help a variety of organizations in Jackson. Thanks to all who are volunteering today – and to those who organized this massive effort: Jo Beth Petty our Director of Student Leadership, and the Belhaven Leadership Council. Sunday the Green Bay Packers will play the Philadelphia Eagles in an NFL Wild-Card playoff game. A half-century ago, those two teams met in the same city for the NFL Championship Game. The Packers lost 17-13, and it was a much simpler game than the complex style of football played today. That was Vince Lombardi’s only career playoff loss. He turned the Packers into winners, who would go on from there to win 5 consecutive championships and bring professional football into the mainstream of American life. An interesting insight to our shifting culture is that the game, 50 years ago, was moved from Sunday to Monday afternoon, because television executives were convinced that Christians would not watch TV on Sunday. Lots has changed in 50 years – on and off the field.